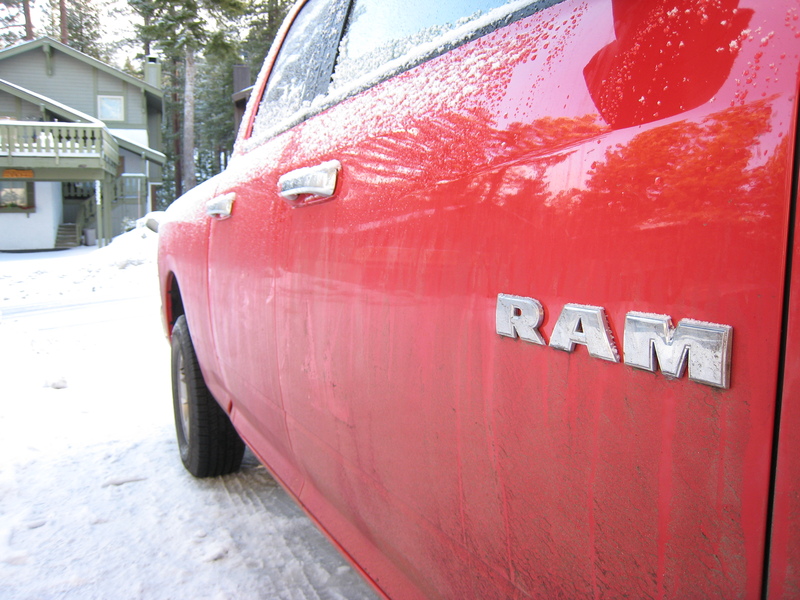 The specs for the Dodge Ram 2500 speak for themselves: it has a 5.7 litre V8 engine, weighs almost 2.5 tonnes, the length is almost eight meters, it’s red. Driving a car like this is a quintessential American experience and one that has been the subject of a great deal of my rhetoric since arriving in the USA. Luckily a recent trip to Lake Tahoe necessitated a car with enough space for five passengers and a few pairs of skis. When the local rental car agent offered a Dodge Ram, I jumped at the opportunity. For a car that 35 people could hide behind, it handles reasonably well. It sort of goes where you point it and my only handling tip is to avoid delusions of doing a U-turn on any roads that are less than four lanes wide. Some quick research reveals that Chrysler claim fuel economy in the range of 15-16mpg in the city and 17-18mpg on the highway. Since I was born in a developed country after 1950 and use the metric system, 16mpg equates roughly to 6.5 km/l. Ouch. After the first week of the trip, we had covered about 500 kilometers and the fuel economy was hovering around the 16mpg mark. Whenever I was designated driver, I was fixated on the fuel economy information which is provided on the driver display. I realised that on the flats the fuel consumption was usually in the vicinity of 25-30mpg. But as soon as the car reached the slightest incline, in order to maintain speed, fuel economy plummeted into the single digits. Uphill, at about 60mph (100km/h) the car was using a litre of fuel every two or three minutes! Later during the trip, I had the opportunity to drive the Dodge solo for a few hours, during a return journey of about 500km. This got me thinking. 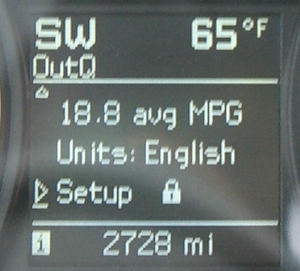 Can I get the average fuel economy over 20mpg? or even 25mpg? 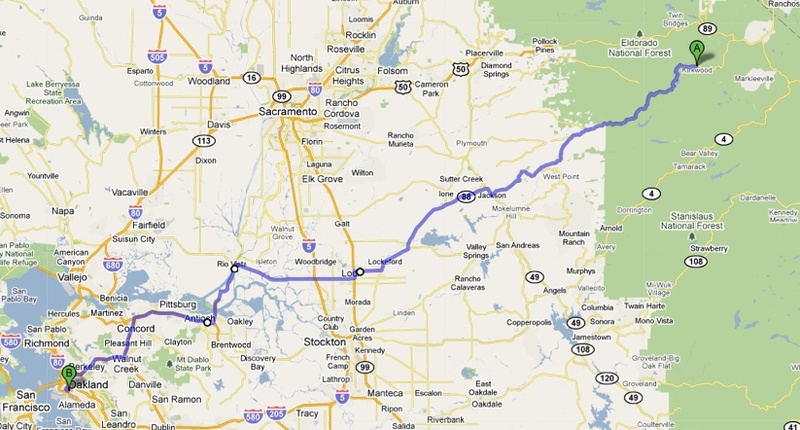 The ‘Kirkwood to Oakland and Back Again Dodge Driving Challenge’ was born. I won’t bore you with the details, suffice to say that dropping from 2500m to sea level during the first leg was the easy part. It was during the return journey that judicious use of the accelerator was required and I was overtaken once or twice on the final climb up to Kirkwood. The results? I am pleased to announce that the average fuel economy during the first leg was over 25mpg and was even a touch over 23mpg upon return to Kirkwood. Chapeau Dodge! And how long did it take? Well, that was quite a surprise too. Over the entire journey I exceeded the Googlemaps predicted trip time by only 15 minutes. So my advice to prospective Dodge Ram owners is to go for gold, squeeze as much as you can out of that 100 litre tank! Heed not the fuel economy predictions from the boffins in Michigan, rather follow Thomasthethinkengines’ three rules for Dodge driving success: (1) put a brick under the accelerator – in case you are tempted to push it down too far (a Toyota floor mat is not an acceptable substitute here), (2) cruise control is fine for the flats, but don’t even think about it when the road has the slightest hint of an upward gradient, (3) put a tarp over the tray, so when you crawl up hills at 40/45mph in a 60 zone, people might think you are hauling something really heavy. Did you jump or were you pushed? Irony: this past October I drove a Pathfinder from Toronto to Fort McMurray, Northern Alberta, guzzling gas along the way only to arrive in Canada’s oil sands – believe me not the place that our petrol came from along the way. My brother suggested we use the cruise control option to save gas, maintaining a steady 120 kmph on the Trans-Canada Hwy. I was still amazed at how quickly we had to fill ‘er up. I’m used to driving waayyy smaller cars that are amazingly fuel efficient my favourite being the Toyota Yaris. The Canadian government has been offering incentives for the purchase of such cars, making them not only more affordable than bigger vehicles but also a good strategy for long term saving. Next Next post: What makes a good hostel?